London, UK, 4th April 2018: Mergermarket, leading M&A data and intelligence provider, has released its Q1 2018 Global M&A Report with financial advisor league tables. 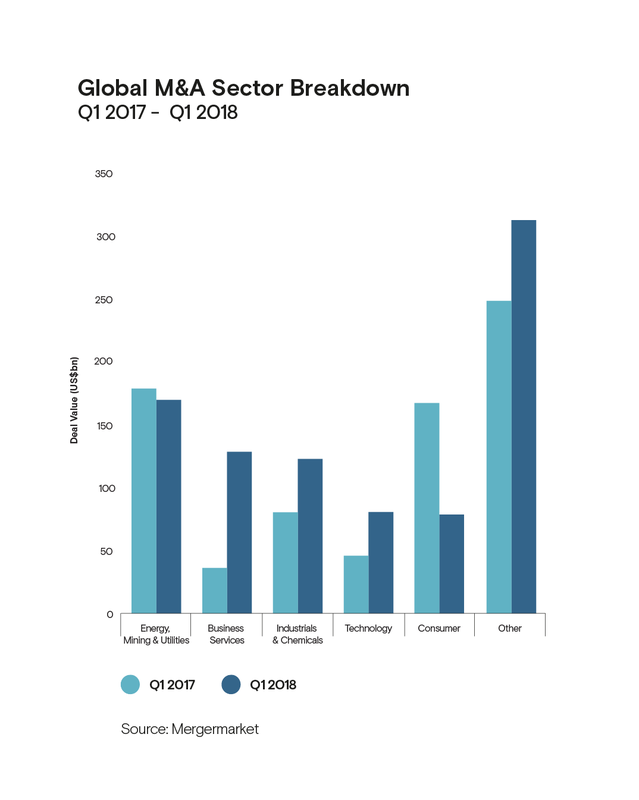 According to new research, the extraordinary surge in dealmaking seen at the end of 2017 has continued through into 2018 as global M&A hit its highest Q1 value on Mergermarket record (since 2001). Pressure from shareholders and the search for innovation continued to drive corporates towards M&A. In the first quarter, $890.7bn was recorded across 3,774 deals, up 18% on Q1 2017’s value. So far this year, 14 deals breaching the $10bn mark have been recorded including the $67.9bn deal between Cigna and Express Scripts. While big tech companies have looked to diversify their offering through M&A, more traditional firms also had to react to newer, more innovative firms, with many looking towards defensive consolidation. Recent trade fights between China and the US have spurred defensive moves further. Global private equity activity remained remarkably high, with many investors pursuing larger targets as the mid-market became saturated. In Q1 there were 699 buyouts worth a total of $113.6bn representing the strongest start to the year since 2007. It also marks the fourth consecutive quarter in which buyout activity has reached the $100bn figure.